In all schools there are children identified as having Special Educational Needs. Children can be identified by their parents, class teachers or outside professionals when they are unable to make adequate progress through the provision that the school provides for the majority. Children identified as having a Special Educational Need who, through discussion involving parents, teachers and the child, are placed on the SEN register, will have an Individual Education Plan which details additional arrangements and teaching enabling them to progress. Further details are available in our SEN policy or through discussion with the Headteacher or teacher responsible for SEN Co-ordination. Nationally all schools will now publish a document called a ‘local offer’; which will outline what schools are offering for pupils with additional needs and/or disability. Please click below to download Yermouths ‘local offer’. We have tried to make sure that we haven’t used jargon and that our school local offer is easy to understand. If you would like to comment on this please email us. Our school email address can be found by clicking on contact us. If you are at all concerned about your child’s progress and development you are able to make an appointment with the headteacher for further discussion. Please find below the link to the new CAMHs website for Hampshire; there are some helpful materials on the website. Hampshire CAMHS is an NHS specialist service for young people aged 0-18 years and their families who are experiencing difficulties with their mental and emotional health. The following document from The Communication Trust includes recommended games and activities to promote children’s speech and language development that are fun and easy to do whilst at the same time encouraging your children’s communication skills. Visit www.thecommunicationtrust.org.uk for further information, free resources and to sign up for regular updates. Elsa support is an Intervention, just like a numeracy or a literacy Intervention. The role is to support children in school, to understand and regulate their own emotional wellbeing whilst also respecting the feelings of those around them. Offering children the opportunity to express their feelings and describe their emotions is a positive experience for both the individual and school. Emotional literacy explores children’s Emotional Intelligence, working on the 5 key elements. Social Skills, Empathy, Self-awareness, Self-regulation and Motivation, we do this through all kinds of activities. Sewing, making self-esteem and self-confidence books, talking about emotions, recognising emotions in other people and playing games to name a few. Looking at friendship & relationship skills when needed. The 5 elements are simplified for individual age and ability to give maximum effect and understanding. The ELSA will meet with a child once a week for 40mins to an hour, starting at half a term up to the full term. During this time we hope to have given the child better understanding of their own emotions and feelings and of those around them, giving them the tools to manage any difficult situations easily. The usual guidelines around safeguarding are respected. 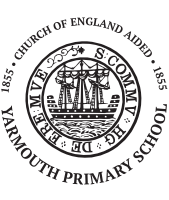 We are very lucky here at Yarmouth to have a small room in the main building off the lunch hall, it’s a very comfortable, relaxed, safe place for the children to explore their emotions.